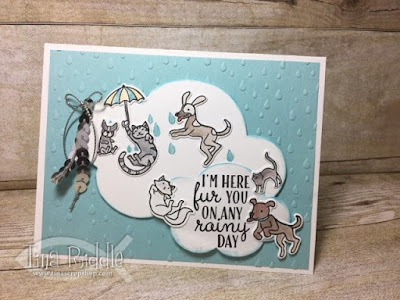 Tina's Crop Shop: PCC232 - Sketch Challenge - Hero Arts Raining Cats and Dogs! PCC232 - Sketch Challenge - Hero Arts Raining Cats and Dogs! Hello and Happy Hump Day again! Are you having an awesome week?? I hope so! We've had wonderful weather here which is always nice! 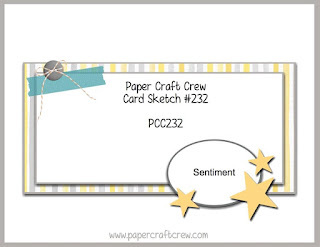 As usual on Wednesday, I'm over with the Paper Craft Crew! This week I'm super excited because I worked out a way to combine the sketch challenge with some fun new Hero Arts goodies that just arrived in the mail!! So I had some good news and bad news. I recently subscribed to the My Monthly Hero Kit from Hero Arts and I loved the February Kit so much that I had to order some of the add ons. The bad news was that since I subscribed on 1/24, I didn't get the February kit because the cut off was the 23rd! I was super bummed not to get that fabulous kit but I wouldn't change a thing with these fabulous add on sets and dies. I adore them! Today, I'm using the Hero Arts Raining Cats and Dogs! Stamp Set and the coordinating Raining Fluff Dies as well as the Nesting Clouds Infinity Dies!